If the mixture is too stiff, add the egg whites or a drop of warm milk, then use the filling to stuff the pasta squares. 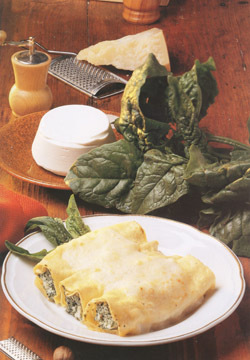 Roll up the cannelloni, and lay then in an ovenproof dish with a layer of béchamel in the bottom. Pour over the rest of the sauce, then sprinkle with grated Parmesan and dot with a few flakes of butter. Brown in a preheated oven at 180°C for about half an hour.